Life can be pretty bland if it were to be mundane, everything moving in clockwork precision without missing a beat. Of course, you will also have to wonder about the kind of adrenaline that you will enjoy if life gets all out of whack. When it comes to food, however, you might want to consider that having some salt and pepper at your disposal would do you a whole world of good, since it will let your tastebuds dance all over the place, as you dig into your favorite meal. 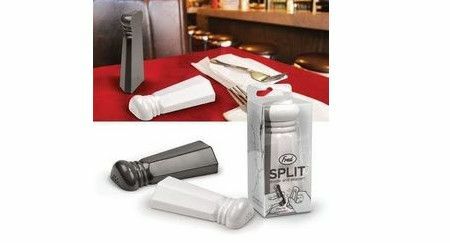 Why not do so in style with the $7.99 Split Salt N Pepper? The name itself gives the game away, as this perfect match lets you shake them together for a perky condiment combo.